Most places you go in the U.S., you'll see smaller vendors like coffee shops, food trucks or market stall proprietors taking credit card payments through the small Square readers plugged into a mobile device. However, as convenient and inexpensive as adopting Square has been for small businesses, the company is yet to launch outside of the United States. That's because its little device is designed to read the magnetic strips on credit cards still dominant in the U.S., rather than the more secure chip-and-PIN tech deployed pretty much everywhere else in the world. 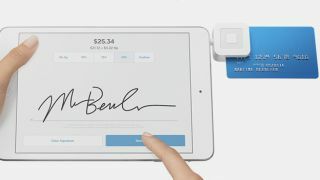 However, all that could change next year when Square releases the new chip-and-pin-compatible reader it revealed on Wednesday, with the firm already encouraging retailers to register interest. "Square revolutionized magnetic-stripe credit card payments by making it easy for anyone to swipe credit cards anywhere. We're bringing the same level of simplicity to chip card payments - so you can continue to do business without missing a beat," the company wrote on its website. The switch to chip-based cards is finally coming to the United States after years of trailing behind the other major markets in the world. Square points out that despite only owning 24 per cent of the world's credit cards, Americans are the victims 50 per cent of all credit card fraud. The change, which will see Visa and Mastercard holders finally get chipped cards next year may benefit Brits as it could conceivably see Square launch in the UK or, at the very least, offer Brits more security when they travel abroad. Currently British businesses are able to make use of the PayPal Here and iZettle readers, who's readers are both chip-enabled.